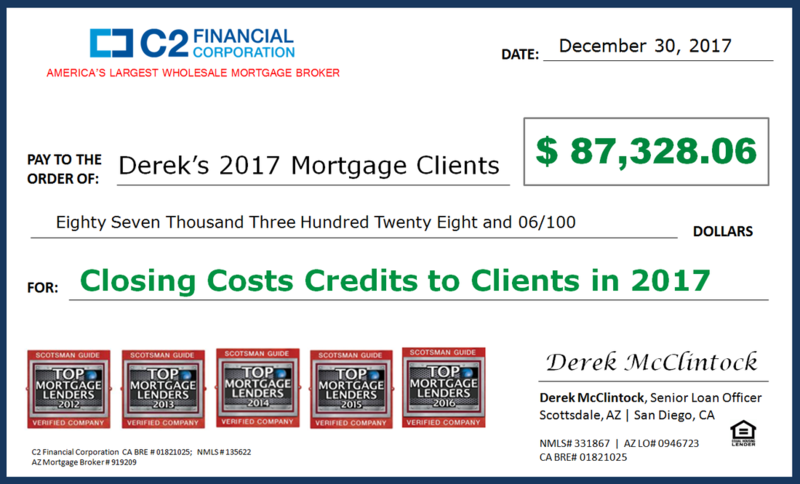 In 2017, Derek and his team gave back over $87,000 to his clients is the form of lender credit to help pay for some or all of their closing costs. ​We don't know another loan officer who even came close to this. How much money can Derek and his team give to you or your clients towards closing costs? Thank you for visiting my temporary page as my new and improved Arizona mortgage website is being built. In the meantime, click on the links on this site and learn how you can get wholesale mortgage rates in the state of Arizona and the differences between banks, direct lenders and us, America's LARGEST wholesale mortgage broker. ​Also, check out our testimonials to see how we are saving our clients MASSIVE amounts of money on their mortgage transactions. Please let us know what questions my team and I can answer for you. We look forward to speaking with you. People LOVE Getting Unexpected Free Money! "Derek is truly amazing. I started my VA loan with my certain "military" credit union (like most seem to do) and I thought I was getting a good rate because I am active military and they cater to us. When my real estate agent told me to talk to Derek and see what he could do, I was hesitant, but called him and he got me the same interest rate, but also over $12,000 in lender credit towards my closing costs which covered ALL of my closing costs. The credit union was giving me nothing. I am SO glad I was introduced to Derek. I saved over $12,000 in my pocket that I wasn't expecting to. I cannot recommend him and his team enough. Use them, you won't be sorry!"